A helicopter on a sightseeing tour of Manhattan made an emergency landing in the Hudson River, leaving all eight people aboard drenched but not seriously harmed, authorities said. The seven passengers and a pilot were pulled from the waters between Manhattan and New Jersey by two nearby vessels as smoke poured from the bobbing aircraft. It appeared the helicopter had engine trouble before it went down Saturday afternoon, passengers said. The pilot deployed yellow emergency floats and made a controlled landing, authorities said. The propellers were askew, but the Eurocopter EC-135, which was owned by Liberty Helicopters, did not appear badly damaged, according to Federal Aviation Administration spokeswoman Holly Baker. Among the passengers to emerge unscathed was 21-year-old Jose Mejia, a New York Fire Department emergency medical technician who helped his girlfriend and others exit the aircraft. All eight people donned life jackets and were in the water for less than five minutes before rescuers arrived, said Fire Department spokesman Craig Mosia. Mejia said he was terrified when he realized something was wrong with the helicopter. "I thought I was going to die; that was definitely my initial reaction," Mejia said. "When I heard the engine and I heard the propellers, my girlfriend looked back at me and I just saw her screaming, and I thought I was going to die." As the eight were pulled to safety, a passenger ferry crammed with onlookers hovered nearby. The rescuers passed the eight to Coast Guard officials, who returned them to shore for medical evaluation, Mosia said. 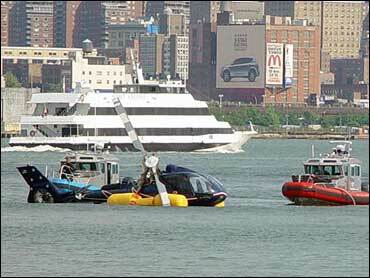 There were no serious injuries, the Coast Guard said. The FAA planned to investigate, Baker said. Liberty Helicopters, which runs sightseeing excursions around the Statue of Liberty, Ellis Island and Manhattan, said it had no comment. Most of its tours last two to 17 minutes.